The Lions won their first officially sanctioned 'home' match, played at Twickenham as part of the Queen's silver jubilee celebrations back in 1977. A capacity crowd, including Prince Charles, was royally entertained and £100,000 raised for the Queen's Jubilee Appeal Fund. Coming just three weeks after the Lions returned from a four month, 26 match tour of New Zealand and Fiji, the players were rested but still a well honed unit. They had lost the Test series 3-1 in New Zealand, but given a good account of themselves and won 21 matches in total. This match was not recognised as part of a Lions tour. International caps could not be awarded as the Barbarians are an invitation team, so it is somewhat lost in terms of records. With 13 of the team that lost the fourth Test in Auckland, however, the Lions were at full strength. Derek Quinnell had recovered from injury to regain his back row spot from Jeff Squire, and Peter Squires was back on the right wing, where he had played the first Test in Wellington. That the great Mike Gibson couldn't get in the side indicates a certain strength in a back division led by captain Phil Bennett. Tony Neary led a pack of eight giants of the era; Fran Cotton, Peter Wheeler and Graham Price in the front row, Bill Beaumont and Gordon Brown as locks, with Irishman Willie Duggan at No.8 between Quinnell and Neary. 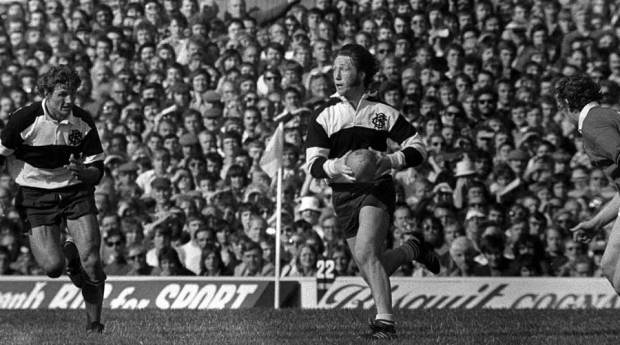 The Barbarian team was captained by Gerald Davies who, along with JPR Williams and Gareth Edwards, would have been automatic Lions selections had they been available for the long summer tour. The French back row of Rives, Skrela and Bastiat, 1977 Grand Slam winners and the best back row trio in the world, were selected en bloc behind a front five including Swansea's Geoff Wheel, who had withdrawn from the Lions tour with heart trouble. Referee Norman Sanson had sent Wheel and Duggan off for fighting in Wales' win over Ireland eight months previously, though Wheel later denied being involved with Duggan, saying "We got the best of it, I don't know what he got sent off for." Such a rich hors d'oeuvre to the season could only have been bettered if the Lions had won in New Zealand, but they rose to this extra occasion in a manner unlikely to be seen in the professional era. It was, according to Peter West in The Times, "a hard, competitive encounter that smacked not at all of exhibition." The Lions took a 6-0 lead with two penalties from Bennett. Andy Irvine was dazzling as he created the opening try, accelerating up the right, slanting inward past JPR Williams and, as the cover converged, throwing an overhead pass for Steve Fenwick to score close to the posts. With the conversion and a further penalty from halfway by Irvine, the teams turned around with the Lions 15-0 up. The margin might have been wider if Gareth Evans, chasing a kick up the left wing, had not been foiled by a bad bounce. The Barbarians created fewer scoring chances while their fly-half David Richards had a difficult day and the French back row men were slow to get into their stride. Their best first half chance was squandered when uncapped Rosslyn Park wing, Dave McKay knocked on a scoring pass. They were sharper after the break. Williams took a crash-ball from Gravell early on to score under the posts, with Davies adding the conversion. But the Lions response was swift and ruthless, first Evans and then Irvine breaking Barbarian defence for their team's third and fourth tries. Only in the final quarter, at 23-6 down, did traditional Barbarian flowing rugby emerge with what West described as "sparkling counter thrusts out of almost nothing". Rives came to the fore, "beavering everywhere", Davies was slipping off tackles and the tempo of play allowed Gravell and McKay to run in two consolation tries. There might have been more but for splendid cover tackling by Bennett. So ended the Lions 1977 odyssey, with the retirement of Gordon Brown and Phil Bennett's words about Tony Neary at the post match dinner ringing in the ears of England's selectors. "I'm amazed," he observed, "how England could ever have left out a player of such ability."